Another lucky invite moved matters on; my cousin Paul had the option to take sabbatical leave from work and wanted to improve his German. His plan was to base himself in Innsbruck for a month, speak a lot of German and get in some skiing on the quiet. A reconnaissance trip was to be arranged for the 13th-15th March. At a pre trip meeting in the pub we discussed our choice of activities. 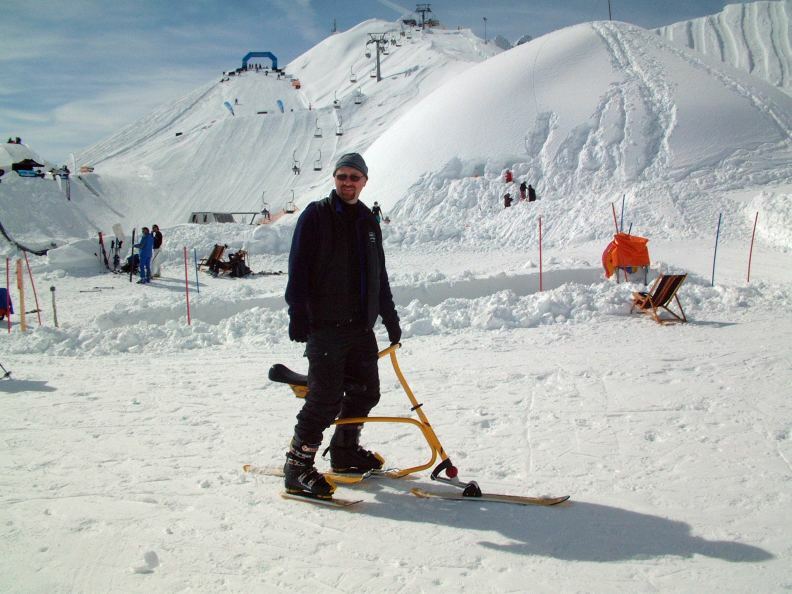 I mentioned that Austria was supposed to be the home of skibiking and that it was something I would like to try "one day".... "J.F.D.I." was the swift retort thrown at me by Marilyn, my cousin's wife, the gauntlet had truly been thrown down. A web search found the details for the Brenter agent in Innsbruck, emails were exchanged and the deal was done. I was to have two 2 hour sessions with a private instructor and the option to keep the Brenter for open practice. On arrival in Innsbruck I made my way to the Ski&Snowboardschule to check that this wasn't some elaborate scam, paid the fees and was told exactly which bus to take to get myself to the base station at Nordpark/ Seegrube. Innsbruck is a proper working city, complete with airport and train station and has a integrated bus service or funicular railway to get you to the ski areas. From the centre of town you can be on the Nordpark slopes within the hour. I checked in with the office and met Rudi my instructor then hit the hire shop for a pair of ski boots. Once suitably equipped he showed me the footskis I would wear, made some fine binding adjustments, got me clipped in and we were ready to go. We walked up the hill a short way and practised slow speed stops. He then briefed me on how to mount the chairlift and before I had a chance to get nervous with a waive of his instructor's pass he had got me through the barrier and away. As we slowly descended the mountain he showed me how to control speed by turning. On the steeper sections it was difficult not to let the bike run away and there were a couple of times I ended up on my side. It was nothing like the awful twisting falls I used to remember from skiing, just a loss of composure, a quick dusting off, then back on the bike for more. By the end of the 2 hours I felt impossibly confident, confirmed a start time for the next day and went off for open practice. The sheer joy of being back on the piste, in control and at speed defies mere words. The next day the conditions were not so favourable, there was less visibility and the snow was harder and more icy. It was good practice for the conditions I was to experience later in Scotland and boosted my confidence to survive the day completely unscathed. We tried some off piste, carving turns, 180 degree and 360 degree turns. The 360 eluded me and I still look forward to the day I can pull this manoeuvre off.